Ben-Hur (Heston) is the rich Jew, who falls on bad times thanks to his old best frined (Boyd), but eventually returns to rescue his family, and claim his wealth and position after he beats his ex-friend in the famous Chariot race. William Wyler (who also won the Oscar for direction). With Haya Harareet, Martha Scott, Cathy O'Donnell, Sam Jaffe, Finlay Currier, and Frank Thring. American producer Sam Spiegel (1904 - 1958), died during production. Zimbalist's other works include: THE CROWD ROARS, BOOM TOWN, KING SOLOMON'S MINES, and QUO VADIS. This remake of the silent film was also based on the 1880 novel by General Lew Wallace. This epic was filmed in Rome and had a cast of 8,000! The 11 minute chariot race is the most exciting and memorable scene in the film. 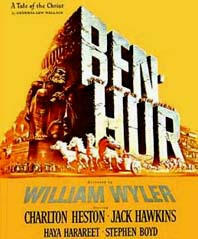 To date, Ben-Hur eared a record eleven (11) number of Oscars.